We sharpen all brands of knives. Cutting with a dull knife is not only hard work it is dangerous. We use the best equipment to ensure your knife stay sharp as long as possible. In a cafe or restaurant, it is important that the tools of the trade are kept in the best condition possible. By having your knives regularly sharpened you ensure a safer work environment. Mr Sharp sharpens all kinds of scissors. We have done work for all kind of people including hairdressers, seamstresses, florists and others. Do give us a call for any blunt scissors. 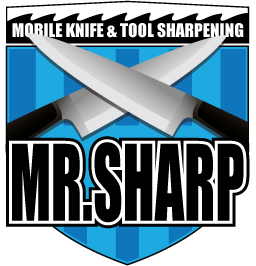 Mr Sharps team sharpen all kinds of tools, including lawnmower blades, axes, secateurs and more. If your tools are blunt you will be working harder. Do give us a call we will fix it for you. Don’t just work harder.